Leave the schaefer farms parking area crossing Schaefer Road to pick up The Hoyles Mill Connector. The trail is pretty well marked and will terminate in Black Hills Regional Park. Here is the route description as found on the more website. 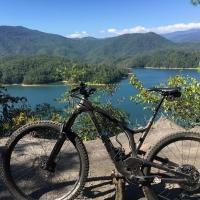 www.more-mtb.org. MORE is the group that built this trail and continues to maintain it. If you like what you see when you ride it consider supporting them. After crossing the first grassy field section, you will reach a paved trail. Turn left as the sign indicates and stay on the path until the next sign. Watch for traffic to the Driving Range as you cross the road. Youâ€™ll take a left off the paved trail, cross a grassy field and enter the woods. Watch for the rock garden. When the singletrack ends, turn left on the road as the sign indicates. This is Hoyles Mill Road. Watch for the washed out section of the road just past the gate. Follow the now gravel road to the Little Seneca stream crossing. Currently a bridge is being built over the stream. In the meantime there is a tree across the stream about 50 yards to the right that has been built into a nice make shift bridge. As you approach the end of the gravel road, look for the sign indicating the entrance to the singletrack to the right. Watch for the dirt "moguls" before you head back into the woods. Follow the singletrack until you come to the 3-way stop. Watch for TRAFFIC and proceed under the railroad overpass. Ride across Little Seneca Lake and look for the singletrack to resume to the right after you cross the bridge. Although this is a short road section it offers a very nice view out across the lake. As you exit the woods at the trailhead, proceed on the gravel past the kiosk. Continue on the same line to the edge of the road and bear to the right to continue through the next field. This takes you back into the woods and leads to Black Hill Road â€“ a closed, gravel park road. Black Hill Road marks the end of the HMC. To access the trails in Black Hill Regional Park, go right as the sign indicates down to the main boat launch area. From there you can choose to do a loop around the black hills trails or back track for a simple out and back. The trail is fast and flowy single track much like schaefer farms. There are a few rocky sections that do make for a nice change of pace from Schaefer. This is a great out and back or can be combined with black hills and schaefer for a 30+ mile loop. Review: Some muddy parts as of Today but the big alert is that a downed tree completely cuts off the trail just where the east end of Boyle's mill road goes from gravel to paved. 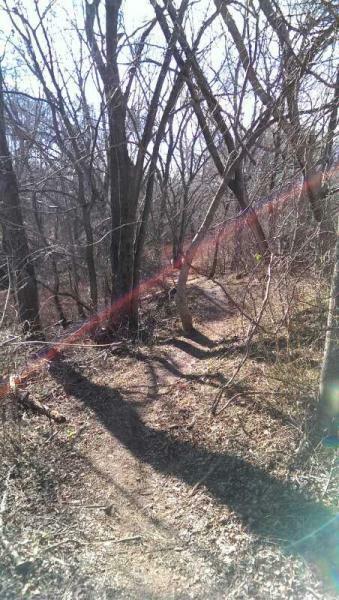 Review: As previous reviewers posted, this is not a trail you would seek out to ride on its own. It truly is a connector trail and it serves that purpose very well in that it connects Schaeffer Farms with Ten Mile Creek and Black Hills while offering riders the ability detour to the Rec Center to ride the pump track. That's about 35 miles of trail of which about 95% is singletrack. The connector offers very little in the way of elevation change and, at one point, you ride on a gravel road for less than a mile or so. For those that ride the MOCO Epic you can really appreciate the connector (as opposed to having to ride through the streets to connect trails). Review: The Connector is great because it connects (haaa) Schaffer and Black HIlls. On its own it wouldn't be anything remarkable but allows you to put down some miles! Review: Nothing too strenuous, but a good, fun ride to connect Schaeffer Farms with Black Hill Park. Only recently discovered this, and I'm glad I did. A great way to add on a few miles after looping around Schaeffer, or add Black Hills in and get the MoCo Epic 25 mile route. Review: Usually ride the connector as a post Schaeffer ride if I still have legs. It's surprisingly fun in spots...well groomed twisty singletrack. But other parts are simply grass meadows. Now that the pump track is in full swing, you can ride Schaeffer then hit the pump track and end it with a ride at Black Hill. You will be blown out! Review: Rode the first few miles from Schaffer Farms. It was grassy trails with a well defined trail in the middle. I can not speak for the norther part. No dabs and dismounts. Great connector trail for an Epic Schaffer to Black Hill ride. Hoyles Mill Connector MTB Trail 3.80 out of 5 based on 6 ratings. 6 user reviews.